All the ladies out there need to keep a check on their diet and the well-being of their body’s system because they are nature’s best creations as they possess a characteristic of giving birth than means they add life to the universe. All this signifies that the women for the reason that they need to stay fertile and reproduce properly in their lifetime have to take care of themselves. Apart from that while the woman reaches the midlife when the menopause cycle starts getting disturbed that is the real tumultuous time for them in their life. At the age of 40 or more the body of the woman changes to a considerable measure. Due to the changes in the body they need to maintain the vitamins that help them go through the menopause cycle change time with ease. At times the vitamins that the body already has are not sufficient so the intake of vitamins and minerals now is necessary for the woman. Some of the essential vitamins and minerals are listed below. One of the most important is the intake of calcium is said that at least 1250mg of calcium daily is required for perimenopausal woman to maintain strong bones and avoid osteoporosis. The woman who has given birth to a child goes through many changes in her bone structure during child birth and this also make the bones weak so it is essential to maintain the intake of calcium. For the proper absorption of calcium it is important to take Vitamin D.
It is best to have multi-vitamins so that the intake of B-6 as well as vitamin D which helps absorbs calcium into the system to help bones stay strong and prevent the diseases that weaken the bones. Even 400 mg of magnesium is also important for the woman to take along with the iron content that is in multi-vitamins. The folic acid in multi-vitamin tablets helps made the blood cells. 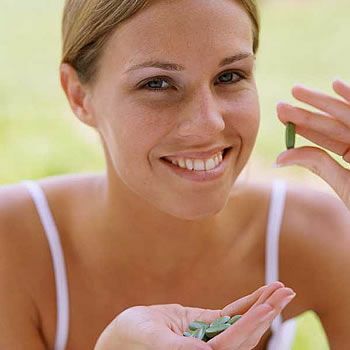 Some of the supplements and additional vitamins include the vitamin E which will help relieve the menopausal symptoms such as hot flashes and night sweats. Vitamin E also helps to maintain the health of the heart. But the important caution that should be kept into consideration is that vitamin E should be taken with the food and no more than 200 IU daily at a time. Besides Vitamin E, Vitamin C helps keep blood vessel membranes strong while acting as an antioxidant.